A polysaccharide is a large molecule made of many smaller monosaccharides. Monosaccharides are simple sugars, like glucose. 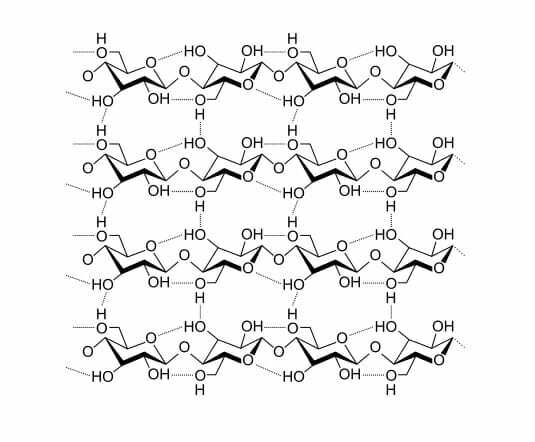 Special enzymes bind these small monomers together creating large sugar polymers, or polysaccharides. A polysaccharide is also called a glycan. A polysaccharide can be a homopolysaccharide, in which all the monosaccharides are the same, or a heteropolysaccharide in which the monosaccharides vary. Depending on which monosaccharides are connected, and which carbons in the monosaccharides connects, polysaccharides take on a variety of forms. A molecule with a straight chain of monosaccharides is called a linear polysaccharide, while a chain that has arms and turns is known as a branched polysaccharide. Depending on their structure, polysaccharides can have a wide variety of functions in nature. Some polysaccharides are used for storing energy, some for sending cellular messages, and others for providing support to cells and tissues. Many polysaccharides are used to store energy in organisms. While the enzymes that produce energy only work on the monosaccharides stored in a polysaccharide, polysaccharides typically fold together and can contain many monosaccharides in a dense area. Further, as the side chains of the monosaccharides form as many hydrogen bonds as possible with themselves, water cannot intrude the molecules, making them hydrophobic. This property allows the molecules to stay together and not dissolve into the cytosol. This lowers the sugar concentration in a cell, and more sugar can then be taken in. Not only do polysaccharides store the energy, but they allow for changes in the concentration gradient, which can influence cellular uptake of nutrients and water. Many polysaccharides become glycoconjugates when they become covalently bonded to proteins or lipids. Glycolipids and glycoproteins can be used to send signals between and within cells. Proteins headed for a specific organelle may be “tagged” by certain polysaccharides that help the cell move it to a specific organelle. The polysaccharides can be identified by special proteins, which then help bind the protein, vesicle, or other substance to a microtubule. The system of microtubules and associated proteins within cells can take any substance to its destined location once tagged by specific polysaccharides. Further, multi-cellular organisms have immune systems driven by the recognition of glycoproteins on the surface of cells. The cells of a single organisms will produce specific polysaccharides to adorn its cells with. When the immune system recognizes other polysaccharides and different glycoproteins, it is set into action, and destroys the invading cells. By far one of the largest roles of polysaccharides is that of support. All plants on Earth are supported, in part, by the polysaccharide cellulose. Other organisms, like insects and fungi, use chitin to support the extracellular matrix around their cells. A polysaccharide can be mixed with any number of other components to create tissues that are more rigid, less rigid, or even materials with special properties. Between chitin and cellulose, both polysaccharides made of glucose monosaccharides, hundreds of billions of tons are created by living organisms every year. Everything from the wood in trees, to the shells of sea creatures is produced by some form of polysaccharide. Simply by rearranging the structure, polysaccharides can go from storage molecules to much stronger fibrous molecules. The ring structure of most monosaccharides aids this process, as seen below. All polysaccharides are formed by the same basic process: monosaccharides are connected via glycosidic bonds. When in a polysaccharide, individual monosaccharides are known as residues. Seen below are just some of the many monosaccharides created in nature. Depending on the polysaccharide, any combination of them can be combined in series. The structure of the molecules being combined determines the structures and properties of the resulting polysaccharide. The complex interaction between their hydroxyl groups (OH), other side groups, the configurations of the molecules, and the enzymes involved all affect the resulting polysaccharide produced. A polysaccharide used for energy storage will give easy access to the monosaccharides, while maintaining a compact structure. A polysaccharide used for support is usually assembled as a long chain of monosaccharides, which acts as a fiber. Many fibers together produce hydrogen bonds between fibers that strengthen the overall structure of the material, as seen in the image below. The glycosidic bonds between monosaccharides consist of an oxygen molecule bridging two carbon rings. The bond is formed when a Hydroxyl group is lost from the carbon of one molecule, while the hydrogen is lost by the hydroxyl group of another monosaccharide. The carbon on the first molecule will substitute the oxygen from the second molecule as its own, and glycosidic bond is formed. Because two molecules of hydrogen and one oxygen is expelled, the reaction produced a water molecule as well. This type of reaction is called a dehydration reaction as water is removed from the reactants. Cellulose and chitin are both structural polysaccharides that consist of many thousand glucose monomers combined in long fibers. The only difference between the two polysaccharides are the side-chains attached to the carbon rings of the monosaccharides. In chitin, the glucose monosaccharides have been modified with a group containing more carbon, nitrogen, and oxygen. The side chain creates a dipole, which increases hydrogen bonding. While cellulose can produce hard structures like wood, chitin can produce even harder structures, like shell, limestone and even marble when compressed. Both polysaccharides form as long, linear chains. These chains form long fibers, which are deposited outside the cell membrane. Certain proteins and other factors help the fibers weave into a complex shape, which is held in place by hydrogen bonds between side chains. Thus, simple molecules of glucose that were once used for energy storage can be converted into molecules with structural rigidity. The only difference between the structural polysaccharides and storage polysaccharides are the monosaccharides used. By changing the configuration of glucose molecules, instead of a structural polysaccharide, the molecule will branch and store many more bonds in a smaller space. The only difference between cellulose and starch is the configuration of the glucose used. Probably the most important storage polysaccharides on the planet, glycogen and starch are produced by animals and plants, respectively. These polysaccharides are formed from a central starting point, and spiral outward, due to their complex branching patterns. With the help of various proteins that attach to individual polysaccharides, the large branched molecules form granules, or clusters. 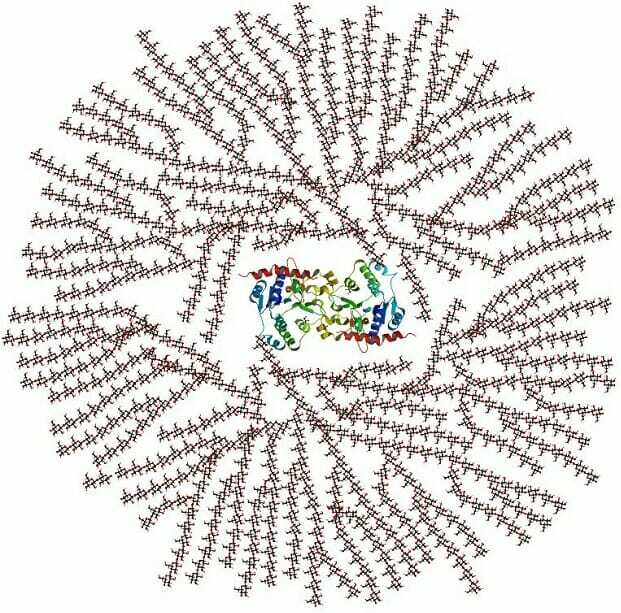 This can be seen in the image below of glycogen molecules and the associated proteins, seen in the middle. When a glycogen or starch molecule is broken down, the enzymes responsible start at the ends furthest from the center. This is important, as you will notice that because of the extensive branching there are only 2 starting points, but many ends. This means the monosaccharides can be quickly extracted from the polysaccharide and be utilized for energy. The only difference between starch and glycogen is the number of branches that occur per molecule. This is caused by different parts of the monosaccharides forming bonds, and different enzymes acting on the molecules. In glycogen a branch occurs every 12 or so residues, while in starch a branch occurs only every 30 residues. Monosaccharide – The smallest unit of sugar molecules, or a sugar monomer. Monomer – A single entity that can be combined to form a larger entity, or polymer. Polymer – Includes proteins, polysaccharides, and many other molecules existing of smaller units combined together. Polypeptide – A polymer of amino acid monomers, also called a protein. 1. If you haven’t brushed your teeth in a while, you might notice some yellow plaque starting to build up. Part of the plaque consists of dextrans, or polysaccharides that bacteria use to store energy. Where do the bacteria get the monosaccharides to create these polysaccharides? A. They synthesize them from sunlight. B. They create them from their genetic code. C. They collect them from the leftover food you eat. C is correct. Every time you take a bit, bits of food get lodged between your teeth. There are monosaccharides present in most foods which can feed the bacteria, and allow them to store energy in dextrans and create plaque. However, the digestive process starts in the saliva, and as the food stays in your mouth, it continues to release monosaccharides that allow for the growth of bacteria. That is why it is important to brush and floss regularly. 2. Plants produce both the starch amylose, and the structural polymer cellulose, from units of glucose. Most animals cannot digest cellulose. Even ruminants such as cattle cannot digest cellulose and rely on symbiotic internal organisms to break the bonds of cellulose. However, all mammals produce amylase, an enzyme which can break down amylose. Why can amylase not break the bonds of cellulose? A. Cellulose and amylose are structurally different, and amylase does not recognize cellulose. B. The glycosidic bonds of cellulose are stronger. C. The extracellular matrix created by cellulose cannot be broken down. A is correct. Although glucose is used to create both molecules, different configurations are used. In amylose, this causes a dense, branching pattern, with many points exposed that can be digested by amylase. Amylase recognizes amylose specifically, and cannot attach to or break the bonds of cellulose. In part, this is caused by the bonds of cellulose being stronger, just not the glycosidic bonds. Cellulose exhibits a number other bonds not seen in amylose that take place between side chains. This also helps it hold its shape, but it is not impossible to break down. Cows spend many hours chewing their wad of plant fibers, slowly breaking the bonds between cellulose molecules. 3. Hyaluronan is a molecule found in the joints of vertebrates that provides support by creating a jelly-like matrix to cushion the bones. Hyaluronan is created from several different monosaccharides bonded together in long chains. Which of the following describe hyaluronan? C is correct. Hyaluronan is a polysaccharide made of different types of monosaccharides, making it a heteropolysaccharide. It is also generally known as a polymer, or molecule composed of monomers. In this case the monosaccharides are the monomers.